Cruising at 7 to 8 kn. at 1,700 rpm the gal. per hour is approximately 1.5. The generator is a Northern Lights 5 kw with 2,872 hours of use. The Jib on the roller furling was re-furbished by Schattauer in 2012. The Main was made by Schattauer in 2012 and is 10.5 oz sail material. The age of the Mizzen is unknown. Under water configuration is long keel and skeg-hung rudder. The fuel tank is aluminum. The water tanks are stainless steel. The two holding tanks are plastic, forward head is 15 gal and the aft is 25 gal. The aft head is a Masterflush with fresh water inlet. Starting all the way forward is a double private cabin with access to the anchor locker. There are two single berths port and starboard. There is seating between the two berths and on the starboard is a counter with storage lockers above and below. Overhead is a rather large opening hatch for lighting and ventilation. Aft is a privacy door to the passageway to the starboard side private sleeping cabins with two bunks over and under with lots of storage cabinets. To starboard across the passageway is a large head with shower. Moving aft into the very large main saloon with its U-shaped galley. The galley provides lots of counter space. There is a large stainless steel double sink with storage above and below. The three burner propane stove with oven is on the port outside position with room for spice rack behind, some room for hanging pot storage as well as storage lockers to the sides. There is a long athwartship counter with storage below and four utility drawers. Along the starboard opposite the galley is another counter with the refrigerator installed below and storage cabinets above. To port is the U-shaped dinette with seating for six. To starboard is a single settee with a pilot berth outboard. Aft to starboard is a chest of drawers, a counter and the refrigerator. Aft on the centerline is the access to the cockpit and to starboard is the companionway to the aft cabin. To starboard in the companionway is the navigation station with navigation instruments mounted above a large countertop with storage below. On the opposite wall is the electrical panel. Aft through a privacy door is the master cabin -- one of the very nicest I have seen. Beautiful teak, mirror, countertop, lots of storage and a double berth athwartship. There is plenty of natural light from the side ports, the overhead hatch and the windows across the transom. Also in the master cabin is the ensuite master head with shower enclosure and access to the stand up engine room with a work counter and tool storage. Interior surfaces are either gleaming teak cabinetry, teak and holly floors, white formica, or designer upholstery. The interior of the boat is kept warm by a Webasto diesel forced air heater with thermostat control and electric heat for the saloon only with thermostat. One plow type anchor with 250 feet of chain. There is a spare Danforth anchor with chain and rode. There are three sheet winches and one furler winch. All are self tailing. Two Lewmar 44 two speed sheet winches. One Lewmar 30 two speed for the main sheet. One Lewmar 16 for the furler. This boat comes with a full boat cover which is new and has never been deployed. Buyers looking for a big, powerful offshore vessel that will also make a wonderful liveaboard should give this vessel a close examination. It shows quality everyplace you look. Wide open decks with lots of safety features. Teak decks in very good condition. Beautiful light colored teak interior. The craftsmanship of Taiwanese master builders is abundantly evident. This boat is large enough to provide more than ample interior spaces. An important feature is the stand up engine room with work bench and storage for tools and engine supplies. She provides sleeping for nine in four separate sleeping areas -- two in the forward cabin, two in the port side cabin, three in the main saloon and two in the master cabin. You will find this vessel shows very little wear and tear. good care from her owner." See this beauty at our Lake Union docks. 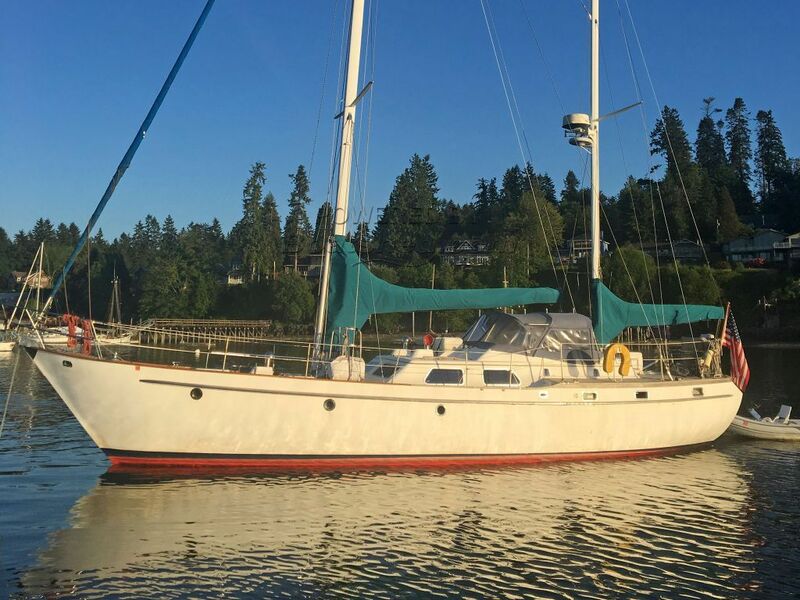 This Transpac 49 Ketch Offshore Cruiser -- Live Aboard has been personally photographed and viewed by Dave Carleson of Boatshed Seattle. Click here for contact details.